Home » 09-10 Offseason » Who Is Aroldis Chapman? There is an excellent profile and accompanying video on Chapman on ESPN. Reportedly, the Mets are meeting or have already met with Chapman, who arrived in New York to begin a tour of his suitors this week. Those suitors supposedly include the Yankees, Red Sox, A’s, Giants, Dodgers, Orioles, Angels, Cubs, White Sox, Cardinals, and of course the Mets. Likely that list is longer — who wouldn’t be interested in a 6’4″, 21-year-old lefthander who throws 100+ MPH? And therein lies the big question — will the Mets be in the bidding for this young man’s services? Some scouts see him as among the top 3 young pitching prospects in the world, and project him to be a sure-fire, frontline MLB starter. Other scouts say he’s “80% ready” for MLB right now. Still others peg him as a future middle reliever. But it doesn’t much matter what the scouting reports say, because, again: he’s 6’4″, lefthanded, 21 years old, and throws 100 MPH. The bidding for that kind of raw talent on the open market BEGINS somewhere between Stephen Strasburg’s 4-year / $15.1M deal and the $32M signing bonus given to 31-year-old Cuban defector Jose Contreras in 2002. Do the Mets have the funds and the chutzpah to make a serious bid? Or are they gun-shy after witnessing the Kei Igawa debacle, and experiencing a similar disaster with Kaz Matsui? On the one hand, the Mets claim to have deeper pockets than everyone says, and adding a top prospect such as Chapman would be a bold move toward putting their money where their mouth is — while also immediately elevating the negative opinion of their farm system. On the other hand, the bidding could go as high as $25M or more — at which point you have to ask yourself, is any one prospect worth that much money? Or are you better off spending that kind of cash in several directions toward both unproven talent and MLB veterans? It’s hard to say without knowing what their budget plan looks like (assuming they HAVE a plan in place). Personally, I haven’t seen enough of Chapman to make any kind of prediction about his future. 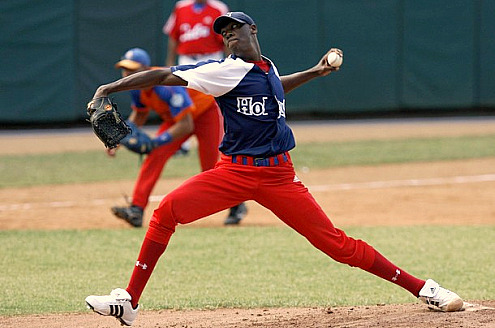 From the videos I’ve seen of him (one is below), he reminds me a bit of Dontrelle Willis — mostly from his tall, lean, lanky frame and his somewhat awkward leg kick and long stride. A lot of his velocity appears to come from his extreme hip rotation, stride, and whiplike arm motion, but that same rotation could put a strain on his shoulder over the long term. At the same time, it looks like he can learn to use his height more to his advantage, both for velocity and in terms of getting downward movement on his breaking pitches — from the clips I’ve seen he is usually too much side-to-side and not enough up-and-down (gravity is a pitcher’s friend … why fight it?). No doubt, he has enormous raw talent that, with polish, could develop him into a dominating pitcher. Hopefully this (potentially) works out better than the last Cuban defector we signed. -For the money we could get a number of international FA. Last year we got Ugeth’s Son which I thought was cool for 1M. for 50M we could get a number of FA pitchers. indeed after last night I am SIGNIFICANTLY more inclined to call Arte Moreno and offer back Krod, then sign our usual cast of muddied relievers (with high ceilings; ie Brandon Lyon, Billy wagner, Saito et al (mix in Bobby P and JJ Putz) with the blatant advertisement that the closer job is up for grabs again. PS i’m with i-dude in looking for a Javier Vazquez (or facimile) in trade, but not necessarily foregoing a bid for John lackey.